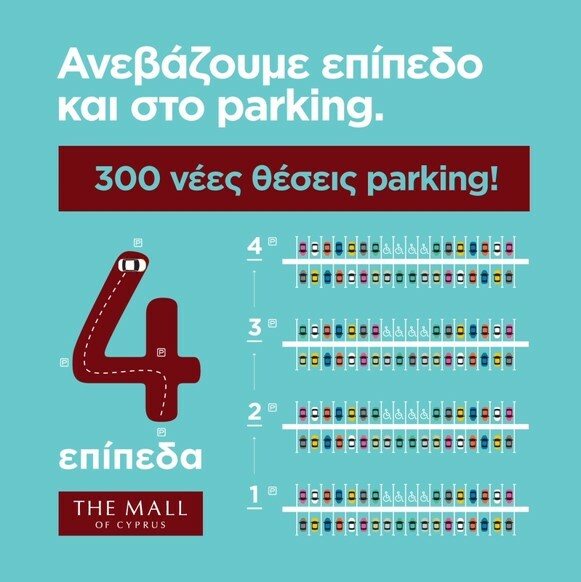 The Mall of Cyprus parking area has been upgraded with the addition of 300 new parking spaces in a total of 4 levels. Within the framework of “Expanding Experiences”, The Mall of Cyprus parking area, which was delivered to the public on Friday 21 December, has been remodeled to provide parking convenience and ease, making customers’ visit even more comfortable and joyful any time of the day. Specifically, two extra levels, a mezzanine and a 1st floor, have been added to the existing basement and ground floor, allowing for 300 new additional parking spots. The majority of the parking spaces will now be covered. Additionally, the circulation between levels will be very easy for cars, while pedestrians will be able to head to and from The Mall of Cyprus commercial areas, via staircases and lifts.